When a tragedy happens, the popular saying “Time heals” is heard many times. I used to say it myself. But I’ve come to the conclusion that saying is incomplete. Time alone does not always heal. We know that minor injuries or disease can heal with time alone. But many physical issues need rest and some help from bandaids, doctors, medicine, surgery, etc. or they worsen and can even cause more issues. The same is true for emotional damage, which is harder to see and therefore easier to ignore. As time passes after a personal or national tragedy, we might be doing “okay” or at least, convincing ourselves and others that we are doing okay. We’ve healed. We’ve moved on. We’ve gotten over it. Healing is possible. Moving on is possible. I’m not sure what “getting over it” means. If it means living life as if it never happened, then that’s (almost) impossible, because one doesn’t get over a tragedy, one learns to live with a ‘new normal’. If we don’t process how the trauma of a tragedy affects us, our life could easily spiral off track (maybe years later) in small or big ways, even to the point of adding more tragedy to our own life or to others. 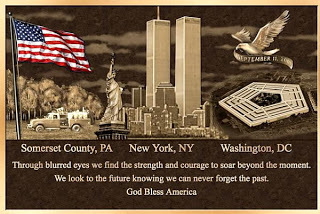 911 is one of those national tragedies that time alone didn’t and won’t heal. Along with time passing, we all needed to take care of ourselves by checking the priorities of our own lives. We needed the love of others, especially to hear us talk about our fears in this new, strange landscape. We needed the peace and comfort of God to still our scared hearts and minds. The people that lost loved ones needed to lean on others to process and grieve their loss. And they continue to need the love and understanding of their loved ones and of their fellow Americans, especially each year on the anniversary. Songs, events and books showed support and gave strength to us, especially those affected the most. Monetary donations from across the world helped bring a measure of healing to individuals and businesses. And each following year – remembering those lost and sharing memories remind us that we aren’t alone in reflecting on the tragedy of 9/11. Time alone does not heal, but with each other and God, healing can come. 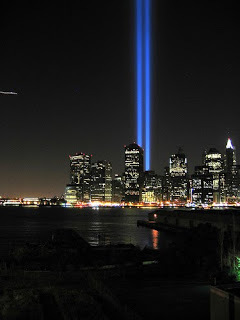 We remember those lost and those who lost. You are so right, God alone can give us peace and comfort. What a beautiful tribute you have posted, so glad you shared the link at (in)courage! I agree with you. Time alone does not heal. As time passes if you don't deal with your feelings of anger, loss etc. I think you have great difficulty moving forward. I remember in nursing school we learned about the stages of grief. When my son Jeffrey died at 16 months I learned that you don't go through those orderly steps. You jump around the steps and work though it with God's help at your own pace. Everyone needs to grieve in their own way. My one daughter said the other day she hates when people have signs on their car in memory of someone. I told her for some people that is what they need to do-others don't need such a public display. Thanks for your thoughts, Barb. I cannot imagine the pain of losing a child – so sorry for that loss in your life. And I think it is so true that each person works through loss and grief at their own pace – that's a wise thing to learn.